So welcome to week 3 of Island Friday and a quick whiz around some of the islands in the Medway estuary in Kent. I was hoping this blog would have all the islands in the Medway, but weather conditions and tide on the day meant that I managed to get around only about 2/3 of the islands, but that still plenty of interesting places to explore in this blog! The crazy winding path shown above shows my route around the islands and typifies the problems of sailing around an island – which way minimises the distance and time. 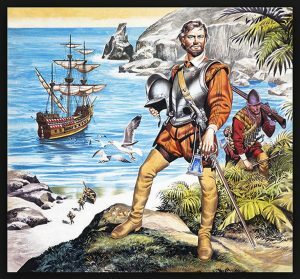 On this trip I was always fighting the tide, as most of the islands cannot be rounded unless there is sufficient tide to raise the water levels enough to sail around them. Having left the Isle of Sheppey (spoiler alert – that’s next weeks blog) I first rounded Deadman’s Island (see last weeks blog) and next up was the flat grass covered Burntwick Island (to be honest most of the islands round here are flat and grass covered!). Until the 18th century, the island was part of the mainland and in the late 18th and early 19th centuries it was used as a quarantine base for disease-infected ships, with the bodies of those who died usually buried on Deadman’s Island 3 kilometres (1.9 mi) to the east. The island was also used for smuggling and in the first years of the 19th century Burntwick became a hideout of the North Kent Gang, a notorious group of smugglers. In 1820 they were confronted by two blockade officers while unloading goods in Stangate Creek, resulting in serious injury to one of the officers and the escape of the perpetrators. The majority of the fifty-strong group were eventually captured with three executed on Penenden Heath near Maidstone and a further fifteen transported to Tasmania. The abolition of import duties in 1831 largely ended the practice of smuggling in the area. The remains of a small house are also still visible on the island, home in the 1840s of shepherd James Woolley and his wife Sarah but by the early 20th century, the tide began to flood the island and the sheep were removed to the mainland. The island then became the property of the Ministry of Defence and a battery was built there, later joined by a torpedo school and barracks during the Second World War. Since then it has been largely unused, becoming an important haven for seabirds. The next islands of Greenborough and Milfordhope Marsh have little to say about them, other than being flat and grassy! Racing the tide I soon passed Bishop Ness and Bishop Saltings before reaching Fort Darnet on Darnet Ness. 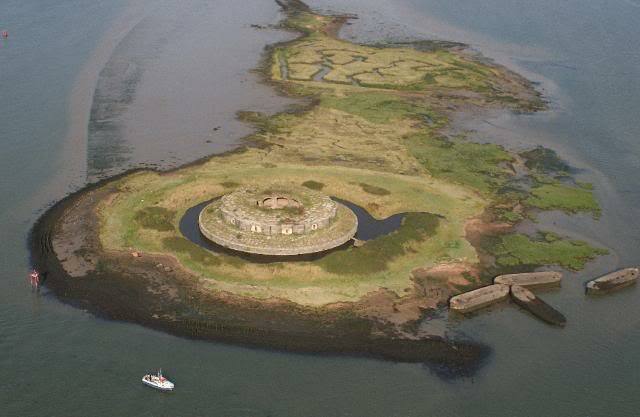 This Fort , like its twin, Hoo Fort, was built between 1870 and 1872.Originally designed for two tiers of guns mounted in a circle, with a boom strung between them. The forts were never used in anger, and were disarmed before the First World War. In the Second World War the fort was used as observation posts, with platforms and pillboxes built on top. Finally rounding the wrecked hulks of boats around Hoo Fort I turned back towards the Isle of Sheppey hoping to bag a couple more islands, but a sudden grounding in the mud made me realise that would be all for today – beaten by the tide but 9 islands bagged – I’d just have to come back another day to complete my adventures in this interesting corner of Kent. Here’s some great drone footage of the islands, forts, wrecks and mud!! In April I’m back out to the Medway Estuary to hopefully finish off the remaining islands so look out for more of this kind of action.